As he began to learn more about chiropractic care, he realized the philosophy of chiropractic care aligned with his beliefs. “I always wanted to be able to assist people and inform them of how you can be helped without drugs or surgery. As a kid, I never wanted to take medicine or get shots.” This further guided him on his path toward chiropractic until it was time to take the road to chiropractic college. In 2005 he suffered a near fatal bicycle injury. It is through the regular chiropractic care he receives, the specific whole food nutrition he takes and the desire he has to live life at a high functioning level, that he is able to practice as a chiropractor and continue his road cycling. This has helped him personally appreciate his patient’s health challenges and can truly understand and support them in their healing process. Attending Life University, Dr. Wartenberg remembers the awakening he experienced through his education at the university. 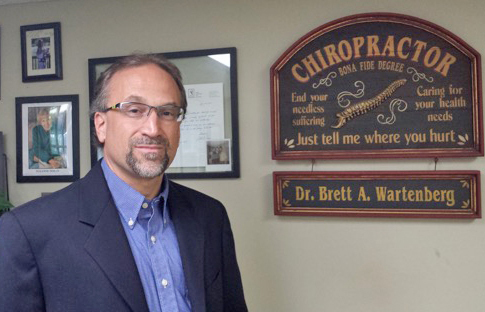 Dr. Wartenberg always appreciated the idea that chiropractic was not considered mainstream. This perpetuated in him “a different way” to help people, in the very way he believed, to heal ourselves. He enjoys helping people find the root cause of their problem and correcting it through chiropractic care. Then, he focuses on nutrition and how it can help you improve your health. He thoroughly enjoys helping, supporting and working with his patients. After graduating Lenape High School in Medford, Dr. Wartenberg further schooled in New York and Georgia. After graduation from Life University, he moved to Illinois to work with Dr. Larry Troxell, with one a handful of doctors in the world that were selected to continue teaching the Gonstead System of Chiropractic. He then returned to his hometown and has been back in this area since 1989. After opening his first office on Main Street in Medford (adjacent to the Medford Circle), he expanded his practice to the current location on Route 70 in Medford. His passion is road cycling to stay fit and is involved with local bicycling clubs. He also enjoys reading about the psychology of personal success and nutrition. If you’re wondering how Dr. Wartenberg can help, contact us today.